Forgotten World is a nomad map for AoF only. I made this map to showcase all the new animals in The Forgotten, as well as a few of the other new scenario editor objects that are now available. 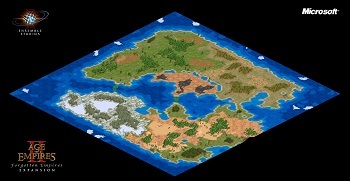 There are four distinct biomes that all appear together in this map: jungle, grasslands, alpine and temperate, and each has a slightly different distribution of animals. In the center of the map is a burning battlefield, which I mostly included to show off a few more cool objects. You start with the normal nomad villagers plus an eagle scout with llama! Make sure you are in The Forgotten! See the Steam Workshop for more screenshots. Tell me if you notice any issues with this map.